Belatacept is a prescription medicine used to treat people for prophylaxis of organ rejection in adult patients receiving a kidney transplant. Belatacept is to be used in combination with basiliximab induction, mycophenolate mofetil, and corticosteroids. Please call at M: +91 9811747774 or Email Us to know more details about the medicine and its cost price in India. Belatacept is indicated for prophylaxis of organ rejection in adult patients receiving a kidney transplant. Belatacept is to be used in combination with basiliximab induction, mycophenolate mofetil, and corticosteroids. Belatacept 250MG Injection should be administered under the supervision of a qualified physician experienced in the uses of cancer chemotherapeutic agents. Belatacept is a fusion protein composed of the Fc fragment of a human IgG1 immunoglobulin linked to the extracellular domain of CTLA-4, which is a molecule crucial in the regulation of T cell costimulation, selectively blocking the process of T-cell activation. It is intended to provide extended graft and transplant survival while limiting the toxicity generated by standard immune suppressing regimens, such as calcineurin inhibitors. 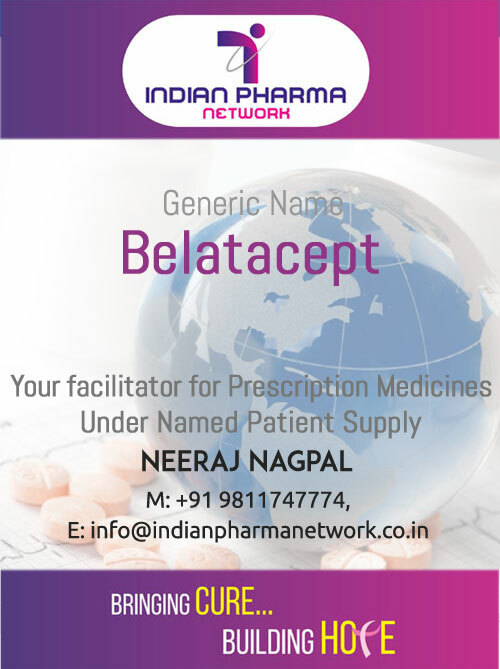 IPN helps patients, doctors and hospitals as a facilitator to import prescription medicine brand Belatacept 250MG Injection on prescription and Import License in Patient's Name only. For generic Belatacept 250 mg injection price in India. Please call at M: +91 9811747774 or Email Us to know more details about the medicine and its cost price in India. For Indian Patients, doctors and hospitals Belatacept 250MG Injection can be made available to patients, doctors and hospitals at Mumbai, Kolkata, Hyderabad, Chennai, Ahmedabad, Delhi, Bangalore, Srinagar, Jammu, Jaipur, Chandigarh, Ludhiana, Noida, Gurgaon, lucknow and Pune and other cities in India. The order will be confirmed only after the receipt of valid prescription of doctor and import permit if applicable.